Ultrafine Particle Size Titanium Dioxide ｜ Products ｜ Chemical Manufacturer, ISHIHARA SANGYO KAISHA,LTD. TTO series are ultra-fine TiO2 products whose particle size is below 100nm. Physically and chemically stable due to the rutile crystal. Various grades are available depending on the particle size, manufacturing methods and surface treatment. automotive paint, toner additives, etc. TTO-W-5 is highly transparent and stable aqueous titania sol of rutile type TiO2, treated with silica on the surface. To obtain high transparency, the dispersion condition is important in general. The finer particle size are, the stronger dispersion is required. Photo.1 Comparison of transparency between TTO and pigmental grade, CR-50. The metallic paint containing ultra-fine TiO2 changes its color from gold to blue by varying the viewing angle. The illustration as below shows the viewing color change by the flip-flop effect. The figure shows transmittance curves when changing the concentration of TTO-55(A) in an acrylic/melamine paint system. As is clearly seen, when increasing the concentration of TTO, UV-shielding capability is enhanced naturally while transparency for visible light decreases to the contrary. The quality can be improved to some extent by intensifying dispersion in terms of the balance between transparency and UV-shielding capability. The dispersion of ultra-fine TiO2 is much more difficult than that of pigmental TiO2 because ultra-fine TiO2 tends to coagulate more strongly. Therefore, in order to utilize characteristics of ultra-fine TiO2 sufficiently, required dispersion energy is several times stronger than that for pigmental TiO2. While it is difficult to achieve the dispersion to primary particles, strong dispersion enables ultra-fine TiO2 to suit to automotive metallic coatings or under-layer applications where surface smoothness is important. 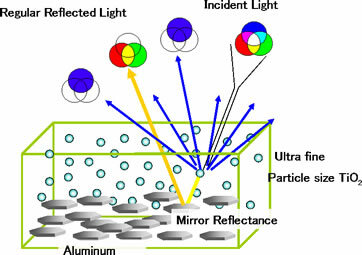 Changes of gloss, paint colors, visible and UV transmittance by intensifying dispersion are given in the figure below. While pigmental TiO2, CR-50, exhibits fairly high gloss and surface smoothness even at weak dispersion, ultra-fine TiO2 shows low gloss at the same dispersion level due to its strong coagulation. However, by intensifying dispersion, ultra-fine TiO2 exhibits higher gloss than pigmental TiO2. This tendency is more remarkable in TTO-51 than TTO-55. In this way, coatings with excellent surface smoothness can be obtained, which can not be achieved by pigmental TiO2. Development of new applications by utilizing these properties of ultra-fine TiO2 is now under progress. While the transmittance of pigmental TiO2, CR-50, becomes lower both for visible light(550nm) and UV(350, 300nm) by intensifying dispersion, the transmittance of ultra-fine TiO2, TTO-55(B) and 51(A), becomes higher for visible light and lower for UV. Since ultra-fine TiO2 is difficult to disperse due to strong coagulation, various methods have been developed to ease dispersion. One of the most effective measures is to improve dispersion by organic treatment. The treatment amount is much more than that of pigmental TiO2 by several to over 10%. As for organic agents, alkanolamine, polyol, siloxane compounds are commonly used. In addition, some products are treated with carboxylic acids such as stearic acid and lauric acid. For example, the figure below shows the effect of siloxane treatment on dispersibility evaluated in PE resins. TTO-55(S), siloxane treated grade based on TTO-55(A), is found superior in dispersibility with higher visible light transparency and better UV-shielding capability, compared with basic grade TTO-55(A). The tested sheet with TTO-55(S) is more bluish than that with TTO-55(A), implying better dispesibility. ISK manufactures ultra-fine TiO2 in two processes, shown in the following procedures. The two processes are called "calcination process" and "wet process", in which various grades are manufactured respectively. * ISK will stop sales of products made by the wet process (TTO-S and -D series) at the end of September 2019. The metallic paint containing ultra-fine TiO2 gives unique appearance which can not be obtained by conventional metallic paint. The phenomenon of color change in brightness and color of coating, depending on viewing angle, is called flip-flop effect. The effect is often applied for automotive paint. The most important property required for TiO2 in this application is weatherability, and TTO-55(D) is recommended from this point of view. In the metallic paint containing ultra-fine TiO2, blue portion of the incident light is dominantly scattered due to its small particle size. Consequently, remaining portion of light, i.e. yellow light, is reflected by flaky aluminum. Thus, scattered light looks like bluish while regular reflection looks like metallic yellow, i.e. gold. So different colors are appeared depending on the viewing angle. Followings are the typical results on flip-flop effect of metallic paint containing aluminum powder. When incident light at -45 deg. comes in, Y and b* show maximum values at +45 deg. which means regular reflection. The paint systems with and without TiO2 show almost similar behavior in Y value, while remarkable difference is seen in b* values. The b* value of the system with TiO2 changes significantly in variation of the viewing angle. Copyright © ISHIHARA SANGYO KAISHA, LTD. All Rights Reserved.